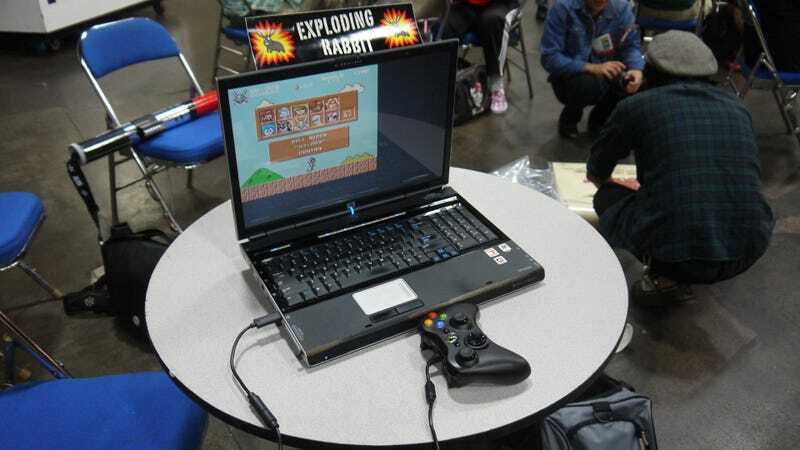 After relaxing with a $2.50 cookie and a $4.00 Coke at the back corner of hall A at San Diego Comic-Con, be sure to stop by the expansive booth of indie developer Exploding Rabbit, the makers of the ever-interesting Super Mario Bros. Crossover. Try to get there before the battery power runs out. On a rinky dink table near the expensive Mrs. Fields kiosks stands Nader Parvini, Exploding Rabbit's unofficial PR person, offering free demos of Super Mario Bros. Crossover to anyone interested. He told me about upcoming additions to the free game, soon to be running on Unity, including a super-secret Zelda II skin coming soon to the retro crossover title. He charged the laptop before coming to the show this morning, and there's a power port over in the corner in case he runs out. Stop by and say hi! Tell him that Kotaku guy sent you.